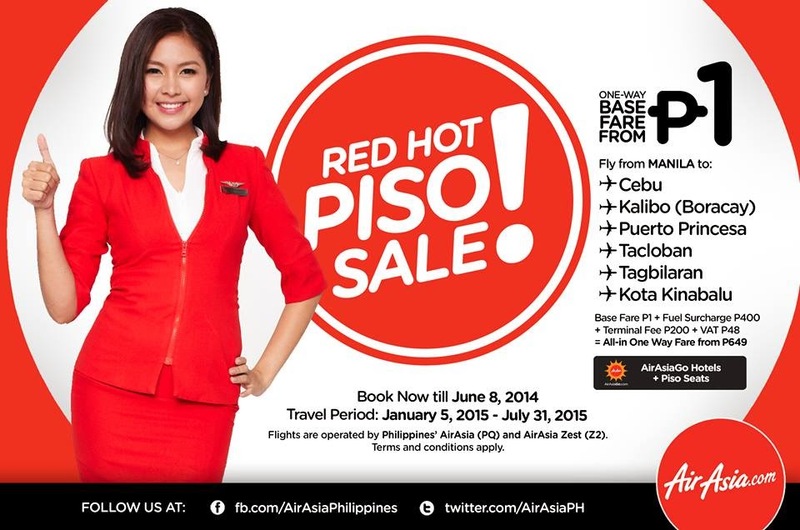 Piso Fare Promo 2015: Folks, here's a new promo for 2015 travel period courtesy of Air Asia Zest! Welcome to their #REDHOTPiso Base fare sale. This is for January 5 to July 31, 2015 travel period. So check out these select destinations below with the P1 base fare. Grab this chance and book your tickets now! Fly from Manila to Cebu, Davao, Boracay (Kalibo), Puerto Princesa, Bohol (Tagbilaran) and Tacloban from as low as P649 and to/from Manila, Macau, Shanghai, Seoul, Kota Kinabalu & Kuala Lumpur from as low as P651 – everything’s all-in! You can also book this via our mobile app! Download our app now at http://airasia.com/apps! Book & 'share' this RED Hot promo with your family and friends! Happy bargain hunting! Maam/sir..paano po ma avail ang promo kapag walang credit cards ..may any options po ba? how to avail /o credit cards can we avail via bank transfer? 199 Piso Fare Promo via Tiger Air Philippines!